Taken from a new batch of Tukiji Nao stationery. Imagine when you go investigating down at the beach, you expect to find a few shells, maybe a starfish or a crab, but never a miniature mermaid! The poor thing looks surprised to be bottled up! wow beautiful scan. i like how the bottle isn't just a plain looking bottle. it actually have designs on it but it doesn't outshine the mermaid that's in the bottle. lovely and amazing as always! thank you for sharing! gracias por la imagen! ;) esta preciosa! 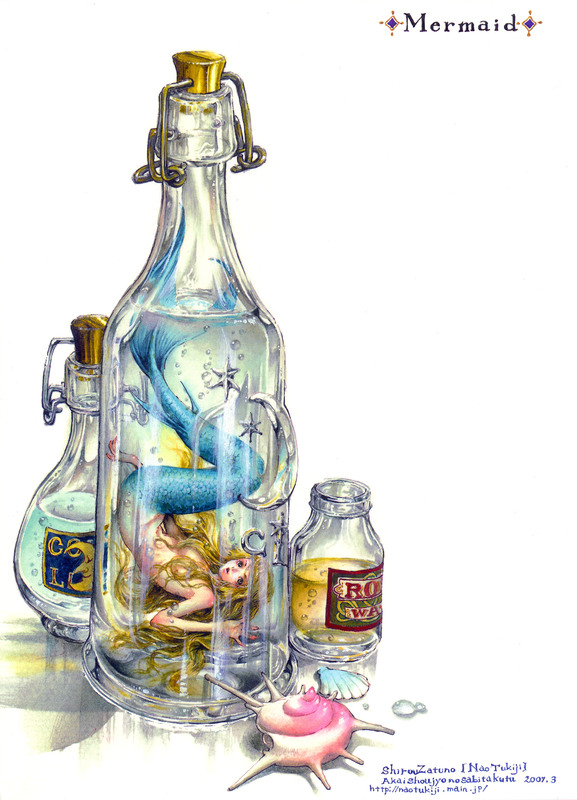 I looked closely and the mermaid is colored like the two liquids in the other bottles. I read what I could of the labels, the blue one definitely says "Cool Light" but I can't make out what the other says. It starts with "ro" and then "water" so I think it says "royal water". What do you think a mermaid is made of?